The good folks at Green Ronin Games have been busy of late, with two new releases that should be of interest to my readers. For all the Wild Cards fanatics out there, they have just released Wild Cards: All-In, A Mutants & Masterminds Adventure Anthology, with four all new ready-to-play adventures in the world of aces, jokers, and aliens. 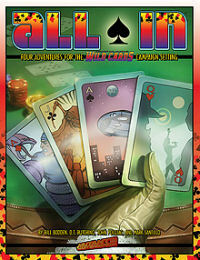 All-In should be on sale now at your favorite gaming store, and is also available as a PDF, direct from Green Ronin. Bill Bodden, Dwayne Butchino, Steve Kenson, John Polojac, and Mark Santillo were the authors. Here’s your chance to have your own characters join the exalted ranks of Dr. Tachyon, Modular Man, the Great and Powerful Turtle, and other Wild Card favorites. Ah, but that’s just the appetizer. For the main course, Green Ronin has rolled out its long-awaited and much- anticipated Song of Ice & Fire Role- Playing Game! The hardcover of the core book is now on sale at game stores all over the country, and a PDF is also available from Green Ronin’s website. 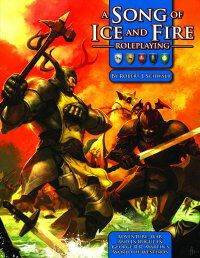 For more information on both the Wild Cards and Song of Ice and Fire games, check out Green Ronin’s own website. And happy adventuring.